Day four of the Chesed Mission began, as always, with energy and excitement at Ilanot. The special children greeted us with a choir performance filled with hopeful messages and left us with smiles and positive energy! We then had the opportunity to interact with them and even enjoy some of the pets from their animal therapy center. 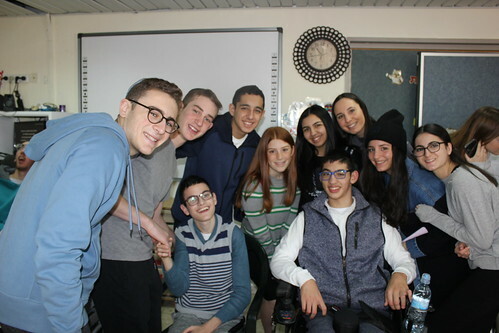 At our next stop, Keren Or, we were greeted by a recent Fatbush graduate, Jacqueline Mizrachi (HS '18), who inspired us to enjoy and make the most of our short, but meaningful, dance party with the children who are severely disabled and visually impaired. Next, Steve Gar taught us to value every moment of life through the detailed stories and history of Pinah Chamah, the rest corner for many soldiers in the Gush Etzion region. He then took us to the location where Ari Fuld A"H was killed. We left stones to remember Ari Fuld's memory and keep his legacy going. We then gave bags full of clothing and needed items to Israeli Soldiers and enjoyed our lunch at the Gush, the best Chummus in the world! To conclude the action packed day we learned at The Blind Museum and at Save a Child’s Heart to appreciate each and every ability that Hashem has given us! Save a Child's Heart is an organization that treats children with various heart conditions in Israel from around the world. We played with the children there and then presented them with gifts. At the Holon Children's Museum: Dialogue in the Dark, we learned to appreciate what it truly means to have the sense of sight by being immersed in total darkness.